New casting has been announced for Wicked at the Apollo Victoria, with Emma Hatton (Elphaba) and Savannah Stevenson (Glinda) both extending their contracts into 2016. 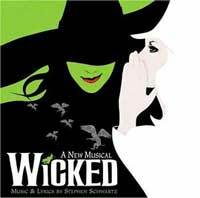 Also continuing with the show are current cast members Liza Sadovy (Madame Morrible), Katie Rowley Jones (Nessarose) and Natalie Andreou (Standby Elphaba) with further casting to be announced. Joining them from Monday 21st September will be Oliver Savile (Phantom of the Opera, Les Misérables, Cats) as Fiyero: Sean Kearns (The Commitments, The 39 Steps, Billy Elliot The Musical) as Doctor Dillamond with current West End ensemble cast member Daniel Hope as Boq and Carina Gillespie (Nessarose on Wicked's UK & Ireland Tour) as Standby for Glinda. Jeremy Taylor (Fiyero), Martyn Ellis (The Wizard), Steven Pinder (Doctor Dillamond), Sam Lupton (Boq) and Sophie Linder-Lee (Standby for Glinda) will all play their final performances on Saturday 19 September 2015.